When online publications place a call on social media for patients to share their story or their images about their disease it makes me worry. A significant amount of trust is needed before sharing personal stories. Where is the guarantee that the information will be treated with respect and used in the manner in which it was intended? Where is the connection with the journalist that will be handling the material? I am a content creator and I ask people on a regular basis to share their stories with me for my writing and my podcast. I’m aware of the trust my interviewees are placing in me and I have tremendous respect for that. I initiate a conversation about that issue specifically before I start recording or writing. This is an important part of the process because I want to tell stories and to support my community. 1. Web sites have budgets. It seems to me that if they want to share stories of people living with chronic illness, there are much better ways to go about it than to ask people to hand over their lived experience without any kind of a contract. Getting interviewed for a story isn’t something a patient would usually get compensated for, and many people work with news outlets (like myself) in order to raise awareness of the impact IBD has on their lives. In these situations, the journalist does the work of putting together the story. Asking for a bunch of comments or photos and putting them into a list is different: it is the lowest form of online content creation. 2. Medications can be identified through a photo. This is personal information and while many in the IBD community share their treatment regimens, the decision to do so requires careful consideration. Once it becomes public, anyone could have access to this information, including schools, insurance carriers, employers, and friends and family. Could it be used against you in some way in the future? That’s entirely possible. We are at an unstable moment with healthcare in the United States and discrimination, even if it is illegal, is real and still occurs. 3. Contributing a photo does not make one a “contributor.” A contributor would be compensated for their work; in most cases this is not what is offered. For those who are looking to tell their stories, I suggest using your own social media platforms to do so or to contact one of the many IBD advocates who are already using their platforms to raise awareness in a respectful, patient-centric way. 4. Once the words or the photo is out of your hands, what will happen to it? It’s true that even when using your own social media platforms, your images could be stolen and used for purposes for which they were not intended. At least in those cases, you can petition for their removal, and many online platforms will investigate and remove images used without the owner’s request. However, giving a photo willingly is another situation altogether. What will the contract entail? Will you be able to use the image elsewhere or will the content provider demand you remove it if you do? Will they alter it? Once it is out of your hands you may have no control or say and that is not a good position to be in. 5. Will the information shared be vetted by a gastroenterologist before it’s posted? Without having someone in the IBD community looking into the content shared, it’s possible there could be erroneous information that could lead to harm. You won’t know what other photos or stories will be submitted. It’s possible the feature, as a whole, may not be reflective of the current understanding of IBD. 6. People with IBD don’t need editors at online outlets to tell their stories. It used to be that you’d need a newspaper or television journalist to take an interest in your story to get eyeballs in front of it. You don’t need them today: you are capable of telling your story in your own way, in your own words, while keeping your rights to it. 7. 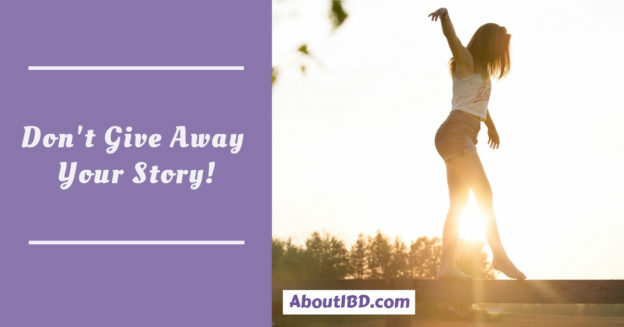 More than one IBD advocate has regretted giving their story away. IBD is challenging to understand, for the scientists who study it, the physicians who care for us, and even for ourselves, who live with the disease. What guarantee do you have that a newcomer to the space, who does not have IBD, treat IBD, or study IBD, will tell these stories with respect? There is a risk of the disease, and those who live with it, being mischaracterized. 8. It may not help your brand. If you are an influencer already, it may seem as though this is a perfect opportunity to increase your visibility. Unfortunately, this will probably not be the case. There may be a short, intense period where more people will be interacting with your content but it will not be sustained and it may come with a side of criticism and negative attention. If you are a speaker or consultant, it may not help you to have a lot of people who are not in the IBD community suddenly following you on social media but then never interacting with your content again and perhaps even unfollowing you after a period of time. I recognize that this sounds calculated but for those who make their living online, it’s a real concern. If you’ve considered these points and are comfortable sharing a story or an image with an online publication, you should do it. It’s important to tell our stories. We shouldn’t be embarrassed or feel as though we need to keep quiet about our journey. My goal is to make sure that people in the IBD community are protected and supported while doing so.